She was rushed to the hospital after complaining of long-lasting headaches that had started after she had taken a nap. 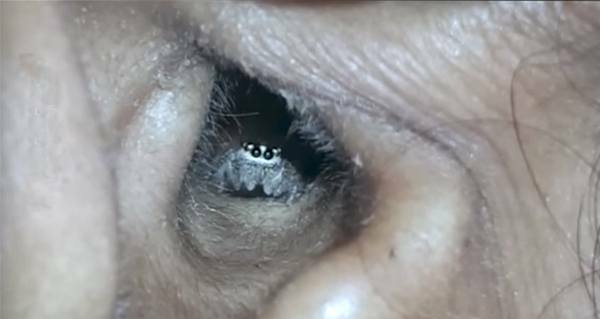 An Indian woman’s headache turned out to be a nightmare after doctors found a living spider inside her ear. The woman, identified as Lakshmi L. from Karnataka, was rushed to the hospital after complaining of long-lasting headaches that had started after she had taken a nap on her veranda. She claimed that she had fallen asleep, and woken up a short time later with a splitting headache. She claimed that she felt inside her ear, and even had her daughter shine a light inside to check, but that neither of them could see or feel anything. Lakshmi described the pain as “nagging” and said she felt discomfort and a tingling inside her right ear. Upon closer inspection, doctors found the culprit. Inside her ear was a tiny, hairy spider, very much alive, crawling up and down her ear canal. As they flashed a light at it, it slowly crawled out. According to the Indian Express, Dr. Santosh Shivaswamy and the other doctors were almost as shocked by the discovery as Lakshmi was. Though it is common to find foreign objects lodged in people’s ears, Lakshmi’s case was certainly out of the ordinary. “It’s rare to see a live spider moving inside someone’s ear canal,” Shivaswamy said. Though it’s out of the ordinary, it’s not the first time a spider has been found in someone’s ear. In March, a woman in England was rushed to the hospital after complaining of a swollen face and an itchy ear. She also described a tingly feeling in her ear and claimed to hear scratching noises. Doctors discovered a long-legged spider living in her ear, and ultimately flushed it out. Next, read about the worlds most terrifying insects. Then, read about the man who released bedbugs on the people that refused to help him with is infestation.